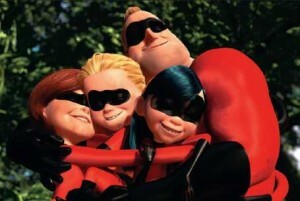 The Incredibles is one of those great animated movies that you can watch over and over again. It’s got laughs, action and heart from the opening scenes to the end credits. So the film’s Blu-ray debut is very welcome. As expected, the film looks great in high-definition, but it looked good on DVD too. Digitally animated movies such as this one transfer so well onto disc. And it is wonderful to hear the cool 1960s-style music, explosions, screams and giggles of Jack Jack in clear high-definition sound. The Blu-ray package is a three-disc set with a mix of new and old special features on two discs, plus the movie on a DVD. The old special features are the same as those on the DVD set released back in 2005, and they are as good as they were then. The only exception is the commantaries; not that they’re bad, but it’s a little odd hearing writer/director Brad Bird (Iron Giant) talk about the DVD when you’re watching the Blu-ray. Disney and Pixar have added plenty of new special features too, the highlight of which is “The Incredibles Revisited: Filmmakers Roundtable.” The featurette is literally Bird and other creative types from the crew sitting around a table (oval, not round) and reminiscing about the making of this film seven years later. They tell some funny stories, including one with a former Disney executive (who goes nameless) who apparently didn’t like the concept of this movie from the beginning and told Bird and his team so in no uncertain terms. When the finished product was screened, the exec apologized. The disc also offers a commentary on Oscar-nominated short film Boundin’ by writer, voice star and co-director Bud Luckey, as well as a visual commentary for the Incredibles companion short Jack Jack Attack. On the second Blu-ray disc, which houses more extras, there’s a fun interactive look at what Syndrome’s island becomes after the movie’s story is over — a resort that offers a shooting range, spa and more, all with the angry robot. But my favorite new pieces are the fun “Stories to Pixar” (the artists’ demonstrations of stories is great) and “Gary’s Birthday,” about how the animators celebrated birthdays at Pixar (it’s cuter than it sounds).